It didn’t take long rookies on the 2013 PGA Tour to make a name for themselves, or perhaps show that experience isn’t always required to win. 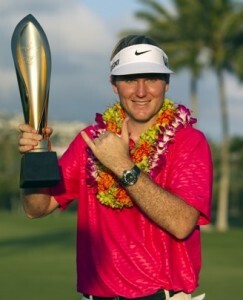 That was especially true at the 2013 Sony Open in Hawaii, the first full-field event on the season. It was there that two rookies stole the show over the course of the four days in Honolulu Russell Henley and Scott Langley traded the lead back and forth for the opening two rounds of the tournament, putting themselves in good position going into the weekend in their first PGA event as member of the Tour. Then after the conclusion of Saturday’s round, the two rookies were atop the lead. Did they crumble on Sunday? In fact, Henley birdied his final seven holes to win the 2013 to shoot his third 63 of the tournament, winning by three shots. A product of the University of Georgia, Henley entered rare company as a PGA Tour rookie to win his first-career start. And it wasn’t like Langley faded into the background; he still carded a final round 65. It was just that Henley made a few more putts on the back-nine. There are 24 rookies on the PGA Tour this season, with Henley obviously leading the way now after getting the win at the Sony Open. He will garner plenty of attention from fans and analysts going forward, especially if he continues to play this way all season long. Next up on the slate is the Humana Challenge, followed by the Farmers Insurance Open as the PGA Tour his the West-Coast swing. Rookies have had plenty of recent success on the PGA Tour. John Huh and Ted Potter Jr. won on the 2012 PGA Tour as rookies. Five total rookies qualified for the BMW Championship in the FedEx Cup Playoffs as well which includes the top-70 in the point’s standings. It remains to be seen how this crop of 2013 rookies will do, but so far it’s been quite a year in the first month of the new season. This entry was posted in News, Opinion and tagged john huh, pga tour, russell henley, scott langley, ted potter jr on January 17, 2013 by Bryan.